Athens, Ga. – Graduate students in the University of Georgia School of Social Work who face financial challenges while earning a degree are receiving help, thanks to the re-establishment of a federally funded scholarship program. The school was recently awarded $2.6 million by the U.S. Department of Health and Human Services, Health Resources and Service Administration, as part of its Scholarships for Disadvantaged Students program. The funds will be distributed to students in need over the next four years, contingent upon the program’s annual review by the federal agency. The award is the largest to be received by the school for the program. The school had previously received four years of funding for the scholarships that ended in June 2016. The school, which began distributing the grant money in August, will continue to award the scholarships to students who are enrolled full time in the clinical practice concentration of the social work graduate degree program. Scholarship applicants must also demonstrate they come from a disadvantaged background and intend to serve in primary care settings with underserved populations. Award amounts vary and are determined based on the level of demonstrated need for each applicant. Awards may be for up to $30,000 per year and cover at least half the cost of tuition. “This scholarship should help at least 50 students each year through 2020,” said David Okech, director of the social work master’s degree program and the scholarship program. “This is a good thing, because there is a great need for clinical social workers in the state of Georgia and in the country as a whole.” This year 52 of 63 applicants were awarded the scholarship. The scholarship will help students like Jessica Weeden, a UGA graduate who received funding in the 2014-2015 academic year. After her first year of graduate school, Weeden realized she would be unable to continue without some form of financial aid, but was unwilling to take out a loan she felt she would have difficulty repaying. “I couldn’t justify going into greater debt and not be able to afford to repay it in my career,” Weeden said. She was considering an offer of a full scholarship for a master’s degree in business administration when she learned of the scholarship. The demand for people like Weeden is increasing. According to the Bureau of Labor Statistics, employment of mental health and substance abuse social workers is projected to grow 19 percent nationally from 2014 to 2024, much faster than the average for all occupations. The state of Georgia projects a 19.7 percent increase in social work jobs through 2022. The average growth rate for all occupations is 7 percent. 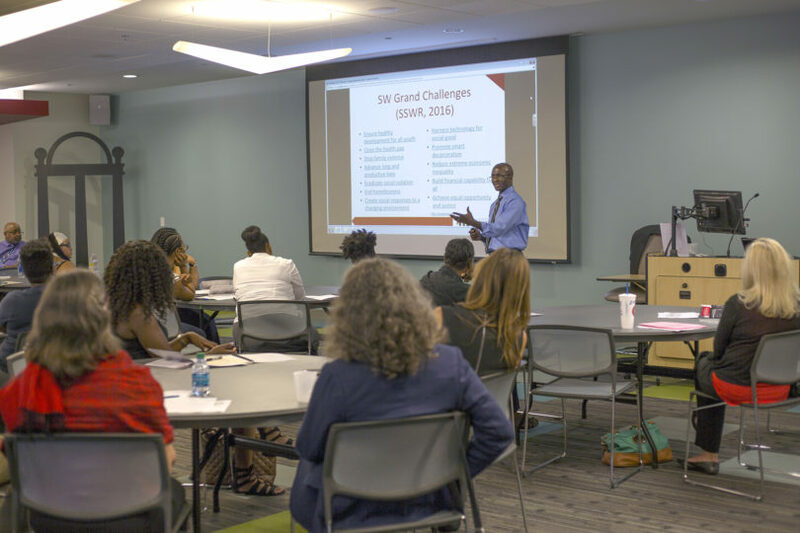 Though the scholarship is only for full-time students, students enrolled in the extended-time social work master’s degree program at UGA’s Gwinnett campus are eligible to apply. Full-time enrollment is defined as nine hours in fall and spring semesters, which permits extended-time degree students to be eligible. In the one semester of six credit hours, extended-time degree students will need to enroll for an additional three credits. For more information, contact David Okech at sds@uga.edu. Founded in 1964, the University of Georgia School of Social Work provides instruction, research and hands-on training in social work practice while emphasizing the integration of social work with social justice. For more information, see http://ssw.uga.edu/.